The Large Blue Butterfly was @SpeciesofUK from 12th to 25th May, 2013. 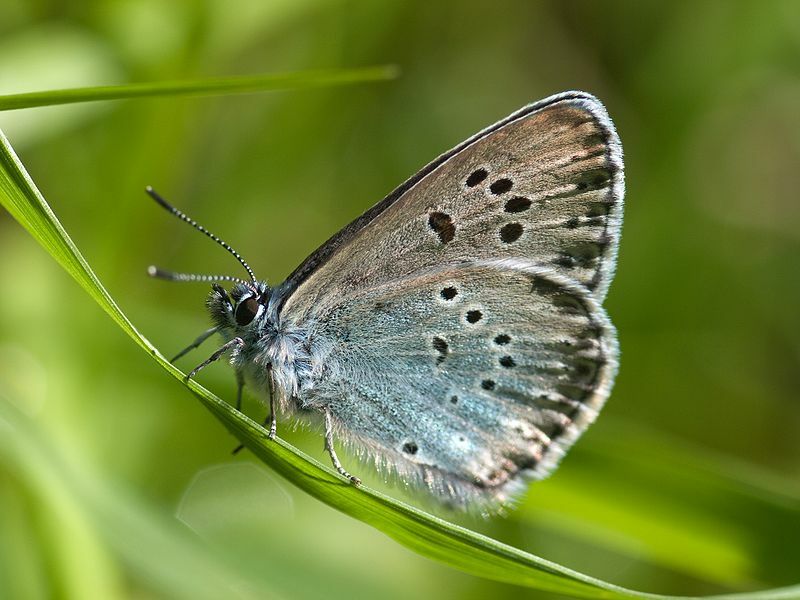 The large blue is one of the UK’s 59 species of butterfly. It became extinct in the UK in 1979, but has since been successfully reintroduced. 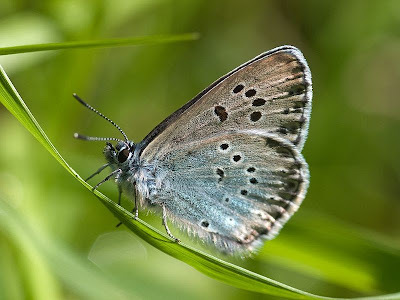 Our large blue is one of five species of large blue across Europe, all from the genus Phengaris in the Lycaenidae family, the second largest family of butterflies with about 40% of extant species. The large blue is also one of 15-20,000 individual species of butterfly across the world! The large blue’s range extends from northern Spain eastwards to Italy, Greece and southern Scandinavia. The large blue is incredibly beautiful. It has deep blue upper wings, an unmistakable arch of black spots, and wing edges fringed with black on its upper forewing. 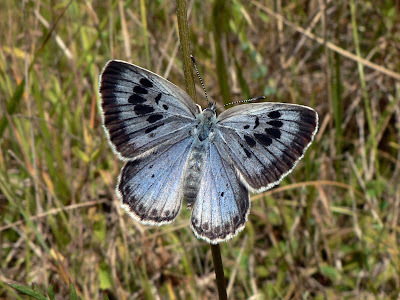 The undersides of the Large Blue’s wings are a silver-grey to metallic silvery blue. Black spots cover the undersides which are fringed with white. Blue butterflies as a group are some of the UK’s smallest butterflies but the large blue, true to its name, is the largest of this bunch. It enjoys basking in sunshine. In bright sun, it basks with its wings closed, but in intermittent sunshine it opens its wings, revealing its gorgeous forewings. But it is also very fragile. The large blue population in the UK plummeted in the 1900s. There were twenty-five sites in 1950, but only two by 1972. By 1979 it was extinct. 1. Red ants of the species Myrmica sabuleti, which are parasitised by the large blue's larvae (more on this later). 2. Wild thyme, which is the larval food plant. It takes a special kind of meadow with well-grazed acidic or limestone grassland and the right micro-climate to support both thyme and Myrmica sabuleti ants, and it was this niche that was disappearing. Changing agricultural practices were primarily to blame. Sadly, the pioneering research that identified these relationships came too late to stop the UK population of large blues dying out. But now it’s back, thanks to a ground-breaking reintroduction programme. 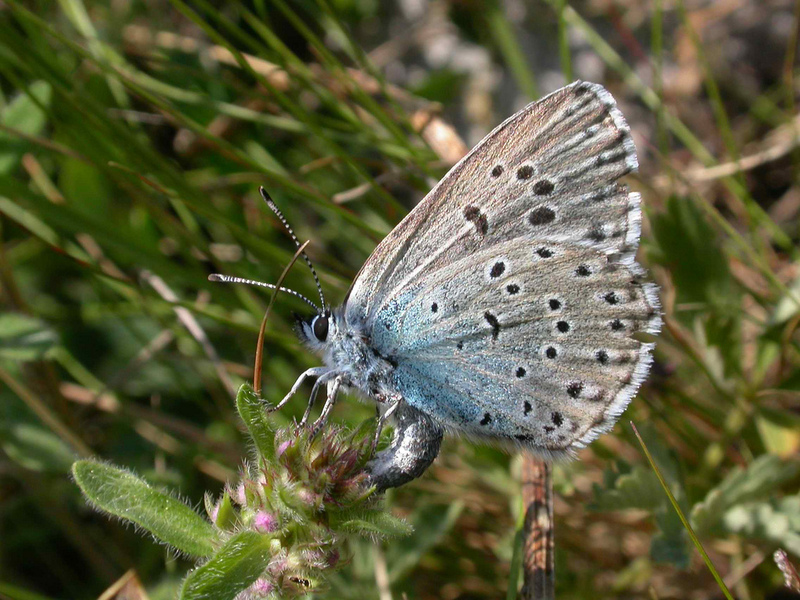 In the 1980s, a major reintroduction of large blues began in Dartmoor. The turf was carefully managed to ensure both thyme and Myrmica sabuleti ants were present. Finding donor butterflies for the reintroduction was hard. Large blues numbers were in decline across Europe. But eggs were kindly donated by Sweden. 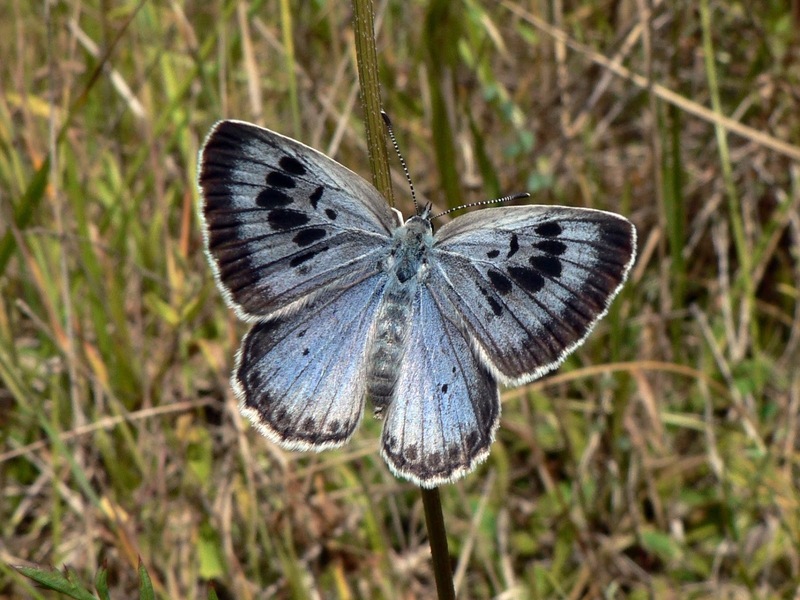 By 1985, just six years after its extinction, large blues were flying in SW England again! 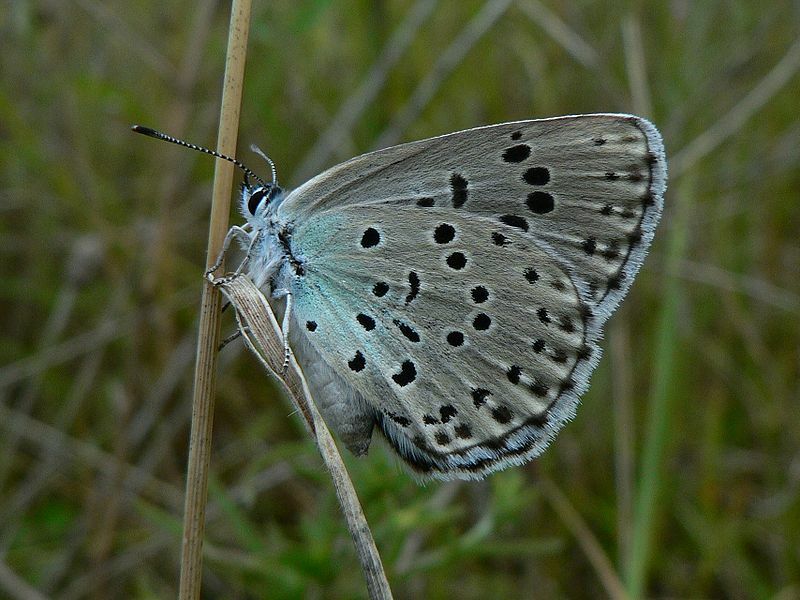 The large blue population has significantly increased since its reintroduction. The increase has plateaued and the short-term trend is stable at about 10,000 individuals. It has recently colonised new sites from the cores of its reintroduced populations. 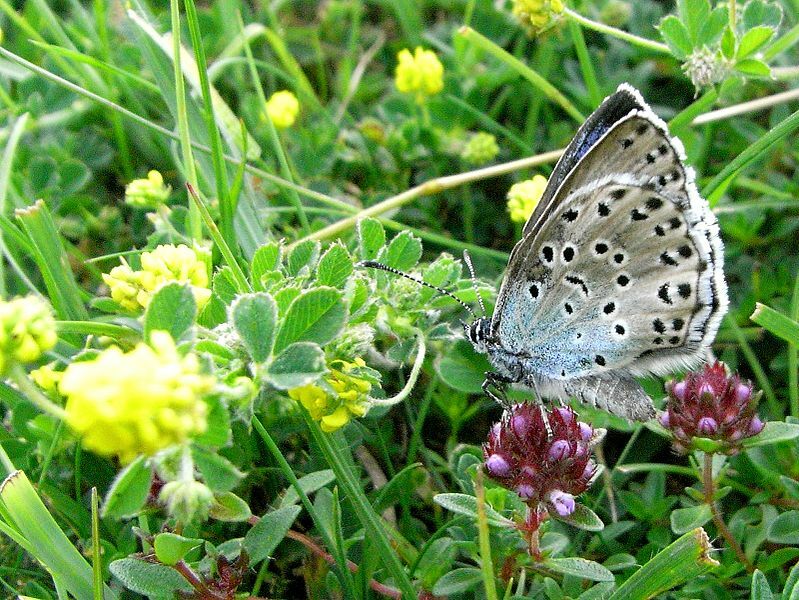 The reintroduction of large blues is a major success story in UK conservation. The approach taken has since been adopted in conserving four other large blue species across Europe. The large blue’s relationship with Myrmica sabuleti ants is quite astonishing. It was first identified in the early 1900s by the great lepidopterists Purefoy, Frohawk and Chapman. The butterfly lays its eggs singly on the flower of wild thyme (if there’s more than one egg, the first larva to hatch will eat the others). The larva feeds on the flowers of the thyme for its first three ‘instars’ (moults). At its fourth instar it drops to the ground. Once on the ground the larva waits for a Myrmica sabuleti ant to arrive. It secretes a scent droplet, distorts its body and rears up, behaviour which somehow fools the ant into thinking it is an ant grub! The ant then takes the larva back to the nest, places it with the other ant grubs, which the larva proceeds to eat. The larva overwinters in the ants’ nest, pupates there (the ants keep the pupa clean), then emerges as a butterfly and crawls out of the nest. 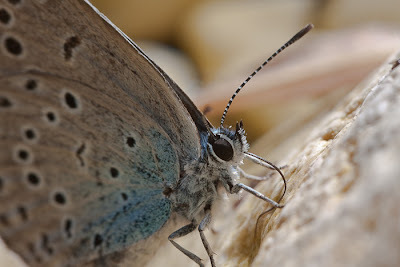 After emerging it finds other large blue butterflies to start the whole mating cycle again. Amazingly, the large blue is only able to fool this one particular species of red ant. Other species of red ant kill it. But if you think that’s amazing check out this other butterfly. Phengaris rebeli, the ‘Mountain Alcon Blue’, is a relative to our Large Blue, from mainland Europe. Phengaris rebeli takes the ant relationship one step further. It not only pupates inside the ants’ nest, it also manages to persuade its ant hosts to feed it like they do their own larvae. Phengaris rebeli even mimics the sounds made by the queen ant to attract preferential treatment from its hosts. Now go and see a large blue butterfly for yourself. The best place to see large blues is Collard Hill in Somerset, where the public have access and support to see this species. Go in late June! But please note! The large blue is fully protected in Great Britain and as such must not be disturbed, handled or interfered with in any way without a licence. Treat it with respect. 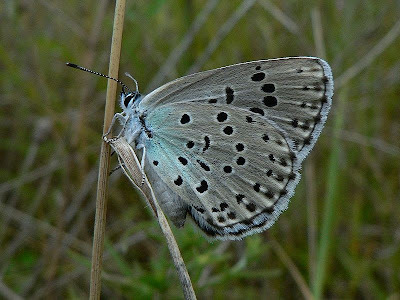 Back in the 1800s, before we knew about the large blue’s dependence on Myrmica sabuleti ants, butterfly collectors considered it to be an enigma. As much as they tried, they couldn't raise specimens in captivity because the caterpillars always died after 3 weeks. If you enjoyed reading about the large blue butterfly, you might also enjoy my post about another species that has been reintroduced to the UK, the Eurasian Beaver.